Career in Commerce Stream after 12th: Individuals, who have taken up commerce stream, have a good future in financial institutions and banking sector. 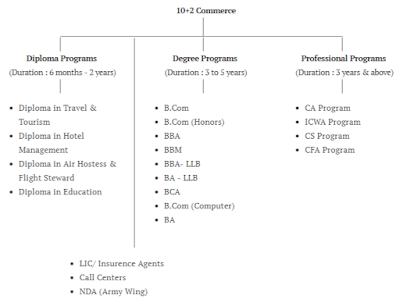 Well, on this page we are providing courses list to make Career in Commerce Stream after 12th. Commerce is all around the grasping the knowledge of business or trade. It deals with studies of market, economics, fiscal policies, industrial policies etc. Commerce is a wide circle of characterized branches viz. accountancy, business administration, finance, economics, marketing, advertisement, e-commerce, and so many. +2 commerce students are entitled for clerical post in government offices, banks, and defense services. For these post you must have to clear the clerical examinations conducted by PSC, Institute of Banking Personnel etc. Well, go through this page to know more about Career Opportunities after 12th and Job Oriented Courses etc. Below are the Careers in Commerce Stream after 12th / B.com / M.Com with & without Maths. After completing 12th with commerce stream, you have to start your further education by choosing UG or Integrated UG courses like five year integrated BBA + MBA. To apply for admissions in UG courses, you must have completed 12th or equivalent exam with commerce subjects from any recognized board. The B.Com degree gives you complete overview of overall business scenario this includes buying and selling of goods also helps in understanding the underlining principles of accounts and economics. The Bachelor of Business Administration (BBA or B.B.A.) is a bachelor's degree in commerce and business administration. The degree is conferred after four years of full-time study in one or more areas of business concentrations. A CA is the member of ICAI (Indian Chartered Accountants Institute) and deals with the financial management and carries out the financial audits. A CA works as a private advisor for an organization. Bachelor of Management Studies or BMS is an undergraduate program for management studies offered by many universities throughout the world. The course allows you to obtain the knowledge and skills needed to assume leadership positions in a wide range of organizations. Bachelor of Commerce in Accounting and Finance knew as BAF Course is an undergraduate program that provides training in the areas of accounting and finance which is offered by many universities in India. Company Secretary deals with the legal activities of any business. It is a corporate professional course. The role of a company secretary is to keep the records| advice| tax returns and evaluate the legal aspects of the organization. The Bachelor of Management Studies includes the study of business mathematics managerial economics business ethics and corporate social responsibility | human resource management etc. Bachelors of Financial Markets is a three-year undergraduate course that focuses on debt markets equity markets risk management microeconomics investment mutual funds and security markets. BCA is 3 year graduation degree course generally for those students who wants to learn Computer languages and after that who wants to join Software Industries. In Today time every course has its own importance. When it comes to this field Diploma as well as Degree programs are available. Based on the program the duration may be between 1-3 years. Certificate Diploma/Degree courses are available when it comes to Event Management. Course duration varies between 1-3 years depending upon the program. To thrive in this field you need to have creativity as well as interest towards fashion and designing. There are different small sections within this field such as- apparel designing accessories designing etc. It certainly has got elements of hospitality sector. But degree course in Hotel Management is more valuable than the hospitality diploma courses that I mentioned above. .
To know more about Career in Commerce Stream after 12th, stay connected with this page www.privatejobshub.in. If you have any query then you can ask in below provided comment box.